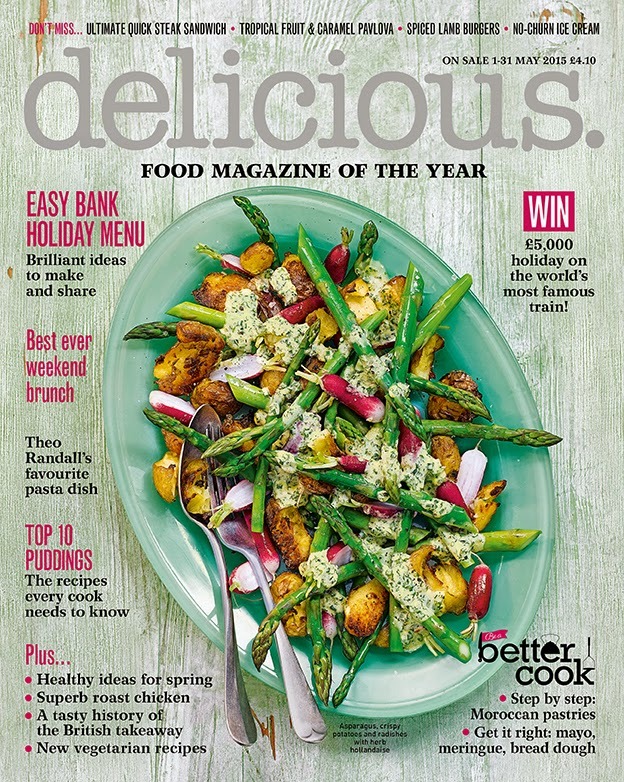 Cakeyboi: Win a Year's Subscription to Delicious Magazine! Magazines are a huge part of my life. I’m not really a book reader, and much prefer reading articles in my favourite magazines. I think this stems from my love of comics from an early age – I started off with Pippin in Playland, moved on to the Beano, Look-In then Smash Hits before devouring magazines as a young adult ( including Sky and The Face in the 90’s). Perhaps unsurprisingly, my magazines of choice these days are food related ones. I download a lot of American food magazines on my iPad, but there is something special that can’t replace an actual physical copy of a magazine. Holding a magazine in your hands, flicking through it, even the smell – something a digital copy can never replicate. That's why I buy actual physical copies of UK magazines and often give magazine subscriptions as gifts. It’s a great idea for a birthday gift for someone. The recipients get something every month delivered straight to their front door, courtesy of you. It really is the proverbial gift that keeps on giving. I was extremely excited when magazine.co.uk, the UK's leading magazine subscription site, contacted me to ask if I would like to be part of their blogger programme. Becoming one of their approved bloggers, I myself receive subscriptions to magazines and write about articles within them, over on their blog ‘The Hub’. For you, Cakeyboi visitor, I am pleased to bring you, via magazine.co.uk, the chance to win a year’s subscription to ‘Delicious’ magazine, the UK’s ‘food magazine of the year’. 12 copies delivered straight to your door. This is worth over £30. If you would like to be in with a chance of winning a year’s subscription to Delicious magazine, entry is via the Rafflecopter thingamajig below. Minimum entry is to leave a comment, telling me what comic you used to read as a child. Other options are there too, including Twitter and Facebook (when it says visit - a ‘Like’ would be lovely). The competition, open to UK residents only, runs until 31 May 2015, good luck to all who enter! The winner will be chosen at random by Rafflecopter. Disclosure Statement: This post uses affiliate links. I am receiving free magazine subscriptions as part of my partnership with magazine.co.uk. I used to read the Dandy when I was a child showing my age! Beano sometimes but I was more of a girly magazine person. Omg, forgot about Look In! I used to love Fast Forward. Strangely (or not) I read exactly the same magazines as you, but I was obsessed with Look-In and then Smaah Hits! I used to read "Jack and Jill" and "Playhour"
Really showing my age here when I tell you I read the original Pippin (no Playland in my day! ), featuring the Pogles Wood characters - also read the Beano & the Dandy, Bunty, June & Schoolfriends - maybe the fact that my grandad had a newsagent allowed my indulgence in reading a wide range of comics up until about 10 when he retired! I used to read Buster as a kid. Mandy. I've just looked it up on wiki and have been laughing at the descriptions of typical storylines. But I did like it at the time. Then Jackie, and then Smash Hits. Bunty, I loved it and every year my aunt would buy me the annual for Christmas. I used to read a comic called School Friend (now long defunct) but I'd also read the boy next door's Dandy and Beano. I used to read the NME every week when it was printed like a broadsheet. Pony magazine - anything with horses in really! Bunty- it was the highlight of my drab week. Bunty-it was the highlight of my week and the only treat my Mum could afford to buy me. I grew up in Australia and read "Tv Hits" Loved it! I used to read Jackie. I used to read top of the pops and smash hits magazines! Ah memories! Amstrad Action, an awesome monthly computing magazine for users of the Amstrad CPC. I used to LOVE Smash Hits. I had their little stickers and boy band posters EVERYWHERE. I was so gutted when they discontinued it! The Dandy, loved Desperate Dan and his cow pies. I was a big Beano fan! I loved reading the beano and dandy comics when I was a bairn and of course the broons! I never had comics or magazines when I was younger. I was too much of a bookworm! Showing my age here!!! June and School Friend. I used to love girl and Jackie! I used to love Mandy & Judy! I read Beano and 'Yogi Bear' mags. I think I liked Yogi, because it was one of the first mags to come with a 'free gift'! It cost 10p....... The magazines I buy now are mainly food-based, although if I go on holiday or am sick in bed, I always like to get a couple of others to cheer me up! I used to read Mizz magazine. Smash Hits. I had a scrap book of the cut out song lyrics decorated with the free stickers you used to get every noe and then. i was a just 17 reader in my teens!! This would be amazing! Fingers crossed!! Oh Boy! magazine as a teenager,I've still got a copy somewhere,I kept it because Wham were in it. I used to like Bunty. I loved the Beano and Dandy. Jackie - it used to get passed round all my friends! first Twinkle, then Jackie then Just Seventeen, then Cosmo. I used to love Smash hits - wow reading through these comments really takes me back. I used to read Mizz! I used to read Playbox or was it Paintbox I can't remember exactly but I loved it! I read Robin then Swift and finally Girl (the equivalent of the Eagle for boys). Girl carried simple recipes and gave me the taste for cooking new things. I was an avid Smash Hits reader for several years. I can remember getting just seventeen every week!!!! The Dandy & Beano couldn't split them. I used to read spiderman! Dandy Beano Bunty and many others would read anything I was able to. The Beano. I used to get one every Christmas and have it read by Boxing Day. Smash hits. Used to love the song lyrics. Just 17, I loved it! I used to love Jackie. Smash Hits for me when I was younger! I used to read Jackie from cover to cover every week! Jackie .. showing my age now! When I was a teenager I loved Smash Hits and covered my bedroom walls with their posters! I'm Canadian and grew up reading all the Archie and Veronica comics. Still have loads of them which my own kids then read throughout their childhood. Bring on the grandchildren! Twinkle Magazine - I had my picture published in it once! Look IN.. For the song lyrics mostly!